and won’t give you anything useful back. Qualitatively, sure. But researchers do multiple regressions with 50-100 observations quite frequently. (See growth regressions, for example). If you get informative results even with small data sets, that’s strong evidence in your favor. If you can’t, that’s at least weak evidence against. bigger the dataset needed to do it. This is true for all the time series data I’ve worked with. But when people talk about climatological data, they often seem to be saying that their data is so strong that these concerns don’t apply. I want to know if I’m interpreting them correctly. shouldn’t, even if it is causal. that effect, we’d need overwhelmingly strong evidence. If this is so, what’s the point of all the rhetoric about how “overwhelming” the data is? Why do so many people claim that, “Now the facts can no longer be denied” if the real evidence is basic physics that hasn’t changed in decades or centuries? thus no good reason to include them in a regression in the first place. out for. So… why exactly do you want to do it? The baseline regression I suggested – temperature on CO2 and a linear time trend – is one that any competent first-year stats student should take seriously. It’s a standard way to see if your story that “X is making Y go up” is superior to “Y just seems to be going up.” Why add other trending variables? To see if the data are more consistent with your story than random made-up stories. Inquiring minds want to know. At root, my bleg is about truth-in-advertising. If the case for AGW comes from basic physics, even though applied statistics alone counsels agnosticism, I wish experts would tell me. The case for significant warming does not come from physics, but from modeling. Yes, CO2 absorbs infrared radiation, some of which is converted to heat (I’ve run IR spectra on CO2, this is an unquestioned scientific fact). Water vapor absorbs much more, across a broader range of wavelengths, so do other gases. The thing is, the marginal warming from an incremental increase in concentration of an absorbing gas falls logarithmically. We are effectively maxxed-out in absorption in the region of IR spectrum that CO2 absorbs in. Yes, there are minor issues with scattering, etc… but they are negligible. The case for CAGW stems from climate models that have many components that are of dubious quality. CO2 concentration is simply one parameter in these models. Under some assumptions, a slight degree of warming (from CO2, or whatever) leads to a positive feedback effect (via water vapor, or whatever) causing massive warming, under other, equally reasonable (and quite possibly likely, given history) assumptions, dampening occurs. Here, modelers pick assumptions that lead to results that garner them and their peers (who are reviewing their papers) status and funding. The fundamental cause of CAGW rhetoric is of course, public choice – going back to Thatcher’s anti-carbon agenda and government control of research funding. Displaced Western puritanism plays a large role as well. As I mentioned on the original thread, both you and Ben Haller seem to be missing the very basic point that you can’t regress integrated time series against each other. You have to regress the delta of the values to de-integrate the series. I agree with biL’s comment above but want to add a few things below. If the case for AGW comes from basic physics, even though applied statistics alone counsels agnosticism, I wish experts would tell me. The problem is that the case for AGW does not come from ‘basic physics’. First of all, human emissions of CO2 are a small fraction of the emissions from natural sources. That means that even if CO2 were the driver of temperature change, at best only a small fraction of the warming can be said to be due to the effect of humans. Secondly, we can see that there are other factors that fit better than CO2 emissions. If you are searching for something that can explain temperature change at the decadal, century, millennial, historical, and geological time scales you might want to look to something other than CO2. Didn’t Malthus “prove” by pure mathematics that we would have massive famines by now? That’s not how regressions work. For X and Y to be correlated, it’s not enough that both increased. (In fact, it’s irrelevant.) For a positive correlation, above average values of X must correspond to above average values of Y, and likewise for below average values. You could easily have a situation where both increased, but the correlation is negative. The first commenter is correct: the case for significant warming does not come from basic physics. Most of the IPCC predicted warming comes from various modeled feedback effects. If you really want to know, I would suggest you’re fishing in the wrong pond. Seconding bil and ed here. The point Ben makes about the expected effect of CO2 is disingenuous. Indeed the direct warming effect due to any kind of CO2 increase, does not lead to the kind of scenarios that the IPCC is warning us about (and even those do not appear to support an economic case for reduced emissions, but that’s another matter). The extreme scenarios hinge on a presumed strong positive feedback, or amplification of the effect of CO2. The science behind this is extremely shaky indeed; something to keep in mind the next time someone tries to argue that ‘the science is settled’ by merely showing CO2 measurements. Yes, CO2 is going up at ‘unnatural’ speed; that hasn’t been a contentious point in decades. If that has much of all to do with the rather unremarkable trends in temperature, is another matter entirely. Actually, what Malthus argued was that it is precisely because of economic incentives to self-control population that the disaster predicted by arithmetic alone does not often happen for humans. He was widely misrepresented, perhaps because one of his implications was that birth control–forbidden at the time–was thus a reasonable response, and certainly better than famine and war as methods of population control. So, Malthus may not have been the best example for your otherwise good point. What kind of regression are we talking about? Linear regression? Parametric, quadratic, baysian? Is there a model for the relationship between CO2 and temperature that we’re trying to fit. I’d be somewhat surprised if there was a linear relationship between Co2 and temperature anyway. One very important issue: We do not have a mechanistic explanation for why an incremental change in CO2 concentrations up from preindustrial levels would cause a major increase in temperature. The effect of CO2 on heat retention is nonlinear, and rapidly diminishing with increases of CO2 concentration in the presently changing range. This means that other mechanisms have to be postulated to amplify this weak effect (e.g. feedbacks involving other gases, such as water vapor), and of course, these mechanisms are not “mechanistic” (as in derived from well-established, detailed principles) but purely conjectural. So, there is no reason to give CO2 a special status in a regression. Based on nasa temp data and scripps co2 data (1959 – present; couldn’t go further back with the co2 stuff I found – pretty easy to grab through top google results) the core model (temp on temp_lag1 + co2 + time trend) holds up linearly. Co2 does dominate time with only those 3 variables. Effect size not terribly strong (CI crosses 0 bound but sig. at .063) but seems to be there. That being said, I didn’t look at deltas (to a commenter’s point about de-integrating time trends) or add other variables or try any fancier specifications. Just simple simple linear ols with all the standard violations of assumptions. Hi Brian. Lots going on here. I’m not a climate scientist by any stretch of the imagination, so when you say “…I wish experts would tell me”, I’m not such an expert. I’m just offering my personal opinions, nothing more. Well, no. Regressions don’t test causality, they only test correlation. To test causality you need to do a manipulative experiment with a control. Even if global temperature were perfectly predictable from CO2 levels, that would still not, in itself, constitute evidence of causation (although it would be very consistent with a hypothesis of causation). For example, both CO2 and temperature could both be caused by some third variable. And for this reason, the problem of correlated variables that I bring up is really a substantial problem that can’t be waved away, and is not necessarily fixed by time series regression, either. Let’s take your “Dow Jones” variable as an example. I would expect that it correlates reasonably well with CO2 emissions. When the economy is strong, the Dow Jones will rise, and CO2 will also rise faster because industrial production is up, people are driving and flying more, more electricity is consumed, etc. When the economy is weak, the Dow Jones falls (or doesn’t rise as fast), and CO2 will also rise less fast (or conceivably even fall). How exactly do you expect regression to be able to separate these two things? Suppose CO2 is the true cause of warming, but the Dow Jones is (hypothetically) perfectly correlated with CO2. How would the regression be able to distinguish the two? Regression is not magic. And indeed, even if CO2 is causal, the DJIA might even correlate better with temperature than CO2 does. Lots of reasons for this, including measurement error, stochasticity, coincidence, and possible other causal variables. For example, methane is also a greenhouse gas, and is also emitted by humans. Perhaps (purely hypothetically) the DJIA happens to summarize both anthropogenic CO2 and anthropogenic methane. That could make it a better predictor of global temperature than either of those, even though it is not causal in any strong sense (because one could imagine a “green economy” in which the DJIA would no longer summarize CO2 and methane because industrial activity no longer caused greenhouse gas emissions). For these reasons, I would never accept, with anything approaching finality, any hypothesis if the only evidence for it was correlation. This is the reason double-blind trials are the gold standard in medicine: you simply must do manipulation, with a control, to experimentally demonstrate causation. If all we had as evidence for AGW were historical time series data, I wouldn’t be convinced of AGW (although that data would suffice to convince me that it was a very strong hypothesis worth exploring). Like I said, I’m not an expert and I don’t know what others would say in response to this. Personally, I’m convinced that AGW is real because of a concordance of evidence from many different sources. The physics makes basic predictions: CO2 will cause a greenhouse effect, thus rising CO2 will cause rising temperatures, all else being equal. This has been understood, at increasing detail, for more than a century, starting with Arrhenius. Those predictions can be tested in simple experiments, and show that CO2 does indeed cause a greenhouse effect, all else being equal. But of course all else is not equal; the world is not so simple, and feedbacks greatly complicate the picture, so modeling is needed. Many models have been written by many different groups, and they consistently agree with the basic physics: CO2 will cause rising temperatures. Indeed, they predict positive feedbacks that will make warming worse than the simple all-else-being-equal physics would predict. And then, against this mechanistic backdrop, we have the historical data, which shows a very strong relationship between CO2 and temperature over a very long timescale (not just the 1880-2011 period that you focus on). By itself, such a relationship would not imply causality, as I discuss above. The argument of causality comes from the physics and the modeling (which is, of course, ultimately based on the physics); those give us the mechanistic understanding that predicts the observed correlation, and thus establishes that it is due to a causal relationship. Science is about testing hypotheses. We have a hypothesis that CO2 causes warming. We can test that with a regression, and the regression shows that historical data is consistent with that hypothesis. Testing other random trending variables, as you suggest, does not do anything useful. If you find that the DJIA also correlates with global temperatures, who cares? If you’re curious, you could try to figure out why, and ultimately you’d find out that economic activity, as represented by the DJIA, correlates with rising CO2. Well, we already knew that. Yawn. What’s the point? Throwing random variables in, without any regard for whether they are correlated with, or even causally linked to, your independent variable of interest, is simply bad statistical practice, and won’t tell you anything; indeed, it will actively deceive you. If you have another actual hypothesis – a plausible mechanistic alternative to CO2 that could also cause rising temperatures – then by all means, go ahead and test that. Lots have been tested, such as variation in Earth’s orbit and in solar activity and in cosmic rays and all manner of things. They have pretty much come up empty; either a negligible effect (on contemporary timescales, although some are important over geological timescales), or a small effect that does not come close to explaining the overall warming trend. That leaves us with CO2: supported by physics, by modeling, and by historical data. We have no plausible alternative hypothesis, despite much thought and work (and much skepticism, denialism, and propaganda by many people funded by the big oil companies, I might add). And we have no strong evidence contradicting the CO2 hypothesis, either. That leaves us with a scientific picture that, to me, feels pretty settled, although no good scientist ever claims that anything has been absolutely proved beyond any doubt. Ideally, we’d have a control Earth and a treatment Earth, and we’d increase CO2 on the treatment Earth and not on the control Earth, and we’d observe the difference. Obviously that’s not an option. So we will never have a manipulative experiment that shows that anthropogenic CO2 is causally responsible for warming on Earth. Without a control, that cannot be shown by historical data. Demanding that level of proof is, therefore, silly and counterproductive. (And even that level of proof is not airtight, as shown by the occasional retraction of results from double-blind studies.) But the level of evidence for causality offered by our understanding of physics and our many computer models is, to me, strongly dispositive. And I think that, given the absence of any plausible alternative hypothesis, continued denial of AGW in the face of that body of evidence is excessively skeptical. I get the impression that most of the readers of your blog are AGW denialists. I don’t have infinite time to debate such things, and I’m not an expert on such things anyway so there’s really no reason for me to be the person making the case. If you’re genuinely interested in such things, why not initiate a conversation with the people who are experts? I have to think you’re well-known enough that somebody like James Hansen would give you the time of day. As for me, I’ll read your further replies, but I don’t think there’s much point in my continuing to participate in the discussion. Thanks for listening, though; I appreciate that you’re trying to investigate these questions rationally, although I’m frankly puzzled as to how you can still have much doubt about AGW. There are many processes at work with complex interactions, some over long time scales, and simple regression over one short set of data isn’t likely to be something worthy of trust. It would be like watching a wave heading down the beach.. and not being aware that tide is coming in so not only will the direction of the wave reverse, it’ll come further up over time. I’d recommend a paper by Prof. Judith Curry in the Bulletin of the American Meteorological Society, readable by those outside the field on:Climate Science and the Uncertainty Monster which discusses just some of the problems of uncertainty in the field leading to questions about the implications of certainty in results made by some. If someone produced a system claiming to forecast the temperature 1 year from today to within half a degree, we would demand evidence of how it was validated given our recognition of the complexity of the issue and track record. The models being used haven’t been sufficiently validated against reality in the way those in other fields would be, yet they imply an inappropriate level of certainty in the end results. Often their “validation” is akin to having a company audit itself. One problem is that in many areas of the models they admit they have an incomplete understanding, and the physics is modeled differently in different programs. Yet they are then tweaked to fit the same data to overcome aspects where they are incomplete. In essence to some extent despite all the sophistication, the models do wind up being glorified curve fitting since they aren’t based on complete models of the underlying processes.Polls show many of those doing research in the field have low levels of confidence in their understanding of certain processes, and yet magically they claim to have certainty in the end results of these models and ignore the “garbage in, gargbage out” question. Someone already recommended on the prior thread an article by McKitrick on the topic of the “global temperature” being problematic. I would add to that by noting that essentially they are using temperature as proxy for heat energy, even though they are two different things. Two different containers holding the same quantity of air which have different water content and/or pressure may be at different temperatures but contain the same heat energy, or the same temperature but contain different amounts of heat energy. The problem is that the vast majority of data out there does not contain the full set of temperature, humidity and air pressure needed to compute heat energy. Internally the models of course grasp the difference between temperature and heat energy, but they gloss over the issue when dealing with the inputs and outputs that they talk about to the public. Dr. Roger Pielke, Sr. has suggested the use of “moist enthalpy” as one alternative measurement. On the question of CO2 vs time trend, I haven’t run any regressions, but my understanding of the very long term data is that the trend in global temperature was negative–but very slow–over a period of thousands of years, possibly since the beginning of the current interglacial. 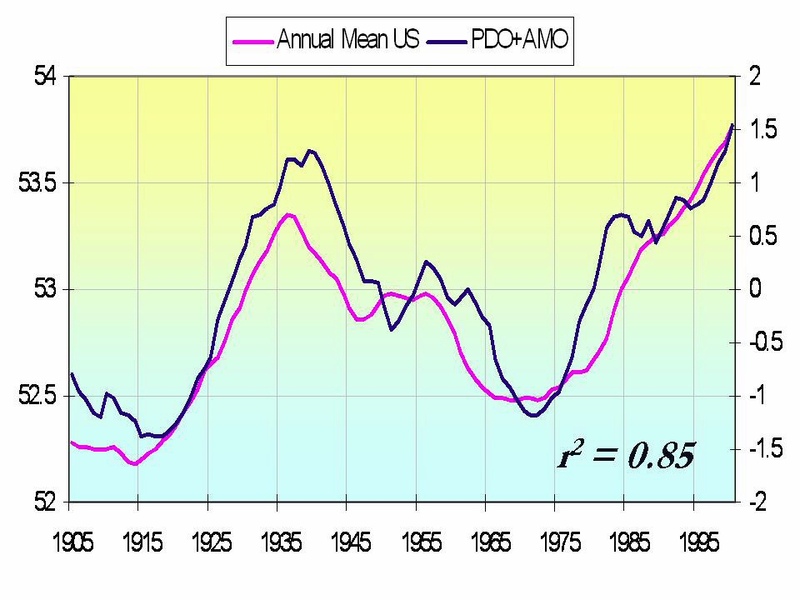 The positive trend over the past century or so is a reversal of that so requires some other explanation, such as CO2. On the question of mechanism, I agree with those who point out that the direct effect of CO2 gives warming, but warming considerably slower than the IPCC projections, and that the latter depend on much less well established claims about feedback, largely via water vapor. This is actually rather contentious. Just how remarkable our current temperature developments really are depends a lot on historical context. Does the medieval warm period require such an explanation? The little ice age? In a perfect world, everything would have an explanation. But climate surely does a lot of things that continue to elude us. That includes its temperature trends over the past century. Note that our ability to make a climate model that starts a hundred years ago and actually follows the 20th century thermometer record, is extremely limited, despite the endless list of parameters we can tune. These models, with their hundereds of parameters, indeed reproduce the first order rising trend (impressive…). But they struggle to reproduce any higher order trends with any accuracy, such as the pronounced stop in warming during he 70ies. Not so impressive. Nor did they predict our current decade of stable temperatures. We can barely even fit the elephant, let alone make it waggle its tail. Would it be nice to have an explanation of recent temperature trends? Yes, thatd be really interesting. But we don’t have any such thing, by the most elementary scientific benchmarks. Many models have been written by many different groups, and they consistently agree with the basic physics: CO2 will cause rising temperatures. Indeed, they predict positive feedbacks that will make warming worse than the simple all-else-being-equal physics would predict. To present this as a matter of consensus is misleading. Estimates from the IPCC itself are all over the map. Indeed those whos funding is conditional on said feedback being positive, tend to report it as positive. There are credible arguments to be made why it would be, and why it wouldn’t be. Either way, the field is mostly opinion, and very little science. And then, against this mechanistic backdrop, we have the historical data, which shows a very strong relationship between CO2 and temperature over a very long timescale (not just the 1880-2011 period that you focus on). By itself, such a relationship would not imply causality, as I discuss above. The argument of causality comes from the physics and the modeling (which is, of course, ultimately based on the physics); those give us the mechanistic understanding that predicts the observed correlation, and thus establishes that it is due to a causal relationship. Such data are certainly shaky grounds to conclude causality when temperature rise leads CO2 rise in these type of datasets; as it does, and as we might expect from the known fact, that increased temperatures indeed have positive feedback into additional CO2 being released. Interestingly, what we do not see in this type of data, is rampant instability. We know the feedback from temperature to CO2 is strongly positive. If the feedback from CO2 to temperature would also be significantly positive, you’ve got an unstable dynamical system. Any hike in temperature or CO2 should lead to runaway warming. Such a dynamic should leave a clear trail in data of that kind. You don’t need a degree in control systems theory to notice the absence of those characteristics. Absent such a degree, one could go by the lack of papers making the claim that there is such a signal. Or the fact that both al gore and you have to resort to not mentioning the lag between CO2 and temperature, which reveals you are well aware that the argument you are trying to make here doesn’t survive the light of day. Basic physics would also lead one to think that maybe the sun is causing global warming. I mean, sure, let’s ignore feedback, which must have had a strong enough of an effect for the Earth to have had such a stable climate over such a long period of time (hundreds of millions of years), but even still there’s a lot of ‘basic physics’ relevant to the global mean temperature of the planet beyond the atmospheric concentration of a single gas. What exactly is ‘significant’? The temp has risen and fallen about a degree Celsius every 400 years for the last two thousand years. What is most telling about the AGW experts is they are not experts in Convection which rules the Troposphere. All wind on the planet is a result of the surface cooling. Almost all the cooling is a result of the Sun heating the Earth’s surface. When and if CO2 were to cause a rise in surface temps, then the Convection rate would increase as the temp difference between the surface and Tropopause increased. In other words, as the surface temp rises, so does the rate of cooling (convection). Another factor that AGW ‘experts’ ignore is the elasticity of the Earth’s Atmosphere. While they call it the Greenhouse Effect, Greenhouses have a static Volume, not elastic. A Greenhouse that expanded when heated would expand and return to equilibrium once it reached the same pressure as its surroundings. Basic physics only justifies an effect much smaller than that predicted. The amplified effect comes from the result of complex feedbacks. This is where the computer models come in, and while they are based in fundamental physics they are by no means comprehensive or perfectly resolved. The exact predictions of climate sensitivity come mostly from “econometrics”, although that includes various distant-past temperature/CO2 measurements using tree remains and ice cores as well as the recent measured temperature record.